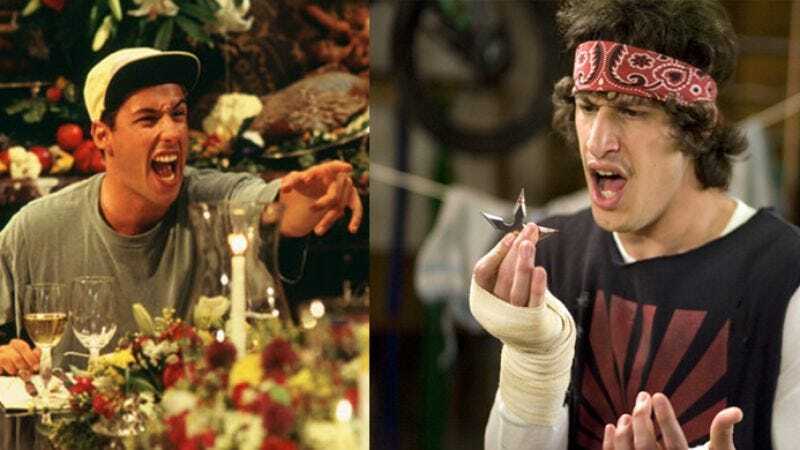 On Saturday Night Live, Andy Samberg would seem to have inherited Adam Sandler’s niche as the show’s resident man-child (or, to borrow Jon Lovitz’s theory, he’s “the Jew”). So it makes sense that Sandler could conceivably play Samberg’s father in the upcoming comedy I Hate You Dad, even if it’s biologically unlikely—given that Sandler is only 12 years older than Samberg, which means he would have been a very lucky and then immediately very unlucky little early bloomer—and it makes us feel incredibly ancient. Nevertheless, both actors are attached to the project currently in development at Sandler’s Happy Madison, with Sandler possibly playing a father who moves in with his son on the night before his wedding and immediately begins complicating things by fighting with his son’s soon-to-be bride. The comical shouting scenes will be epic.